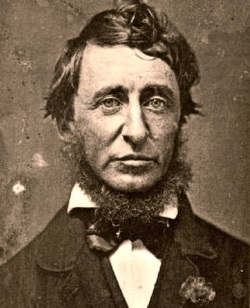 Henry Thoreau's journals reveal consequences of global warming. March 14, 2012. Richard Primack, a biologist at Boston University, has used the journals of Henry David Thoreau and another naturalist to reconstruct the flowering dates of common plant species in mid to late nineteenth century Massachusetts. Primack compared these records to today's flowering patterns in an article published in the February 2012 issue of the journal BioScience, arguing that 43 species now flower an average of 7 days earlier than they did in Thoreau's time. Thoreau wrote just after the conclusion of the Little Ice Age; since then temperatures have risen by 2.4 degrees Celsius in urban areas like metropolitan Boston, which includes Thoreau's Concord. While some species are capable of changing their flowering times in response to the shifting climate, their less flexible counterparts are vanishing from Massachusetts. In fact, Thoreau described some 21 different species of orchid, and just 6 remain today. "What that result tells us is climate change is not only affecting flowering time but also affecting the abundance of species in Concord," Primack concluded. "Warming temperature is causing some species to be winners and some species to be losers." Primack's study has received significant media attention, part of an ongoing surge in the profile of work related to historical climatology. One of the most fascinating aspects of that media attention: the reference to volunteers tracking seasonal events for the USA National Phenological Network, whose efforts may corroborate some Primack's claims regarding early flowering times in today's Massachusetts. Crunching numbers is often an important part of both scientific and historical research; outsourcing that work to eager volunteers on the internet offers some very exciting possibilities for future study.